My Aunt got me these fantastic spices from a local shop called Savory Spice Shop in Boulder (www.savoryspiceshop.com) and I was looking for a way to start using them. 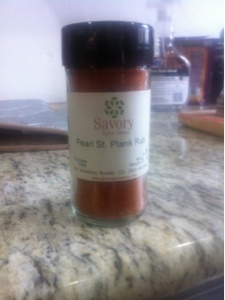 One that I thought smelled particularly good is the Pearl St. Plank Rub - and it's perfect for salmon - so it was perfect for dinner! It has a nice mixture of sweet, heat and BBQ flavors that marry well with salmon. Sweet flavors and salmon pair well together. 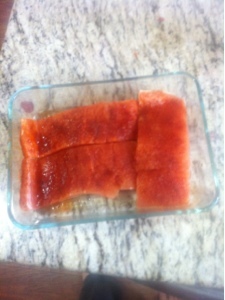 Place fillets into a dish and spray with olive oil, then sprinkle on spice rub and let rest about 10 minutes. Quarter your mushrooms into nice sized chunks, then drizzle with olive oil, salt and pepper and add some fresh thyme. 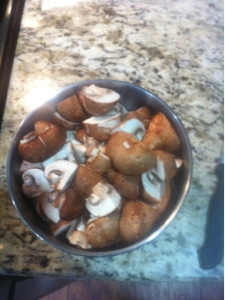 Place on baking sheet in oven for 15-20 minutes until mushrooms are roasted, soft and browned. Then add salmon fillets to hot skillet with 1 tablespoon each butter and olive oil and sear flesh side down for 2-4 minutes depending on thickness. Flip carefully and sear for an additional 2-4 minutes on skin side until crispy and brown. 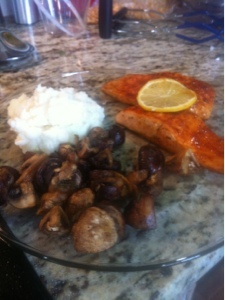 Remove from skillet, add some mashed potatoes and the roasted mushrooms and you have the easiest dinner ever!